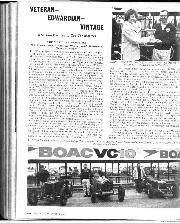 The Vintage SCC held another successful race meeting at Silverstone last month, in sunshine, without accidents, but with enough exciting incidents and close racing to hold the interest of those present, but with Neil Corner not on winning form, while the ERAs were mainly non-runners. The traditional one-hour high-speed trial opened the day's sport, 17 drivers qualifying for awards, including Riddle in his charming vee-twin GN, its Vitesse engine having an endless chain driving the o.h. camshafts, which he drives as nonchalantly as other folk do their Ford Cortinas. The first 5-lap handicap saw Hine's Lagonda with replica Le Mans body, helmet wings, and a "cooking" V12 engine take the lead from the second lap, to win from Russ-Turner's p.v.t. 41-litre Bentley Special which has a foot off the original wheelbase and which made fastest lap at 70.6 mph., overtaking third place man, Elwell-Smith's 1928 Aston Martin, on lap 4. Marsh's uncouth-looking Alvis Special with Speed 20 engine had little difficulty in winning the next 5-lap handicap, being unchallenged from lap 2, Reddaway's 1926 Anzani Frazer Nash and Clark's Meadows HRG following it discreetly home. The Alvis upsets the purists but it achieved fastest lap, at 63.89 m.p.h. The first of the important events, the 10-lap Boulogne Trophy Race for vintage racing cars, had Corner entered in both Sunbeam "Tiger" and Type 35B Bugatti. He chose to run the French car but probably regretted the decision. Because, although he caught the flying Moffatt in Wall's single-seater Type 35B after the opening lap, to lead until lap 7, his car then went off song and Moffatt, who was having a rough ride with the back-end of the Bugatti frequently off the ground, was able to win as he liked from the luckless Corner. St. John's immaculate Type 35B was running on its own in a secure third place, which Hine's Bentley failed to disturb. Corner was mystified by his car's loss of power but wondered if he had inadvertently knocked the ignition lever to retard while maintaining fuel pressure with his left hand. His only consolation was fastest lap, at 79.74 m.p.h. Bergel drove his Type 35 Bugatti with his face covered as if at Greenford dirt-track. Morley drove determinedly in the Pacey-Hassan Bentley which had its Brooklands radiator and cowl, and Rowley deputised in the 1914 GP Mercedes, its owner, Philip Mann, being deprived of the first race in it, due to Dock Strike commitments. It had taken a TV cameraman round in the morning but proved difficult to start and joined the race late. Also, its brakes tired after three laps. . . . The 15-lap Hawthorn Trophy Race came next, for historic racing cars. The Hon. Patrick Lindsay's ERA "Remus" having broken its crankshaft and Murray's ERA having had trouble with its head, "Remus's" head was used on the 1934 car and Lindsay drove it. 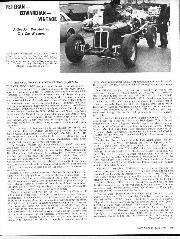 As the flag fell Corner, as expected, went into the lead in his GP Aston Martin and had very soon lapped Bergel in his 250F Maserati, which was painfully slow in spite of Bill Lacey having worked on its engine, as was Clinkard's sedate 4.3-litre Alvis Special. Corner looked all set to win, but on lap 6 he pulled off the course before Woodcote and went to the pits to retire, the fuel pressure apparently in order but the engine nevertheless being starved of fuel. This put Bill Wilks' Lotus 16 into the lead and he drove carefully, to retain it, a popular victory for this usually unlucky driver. Out of his sight Cottam ran in second place in his smart 1957 2 1/2-litre B-type Connaught, which he had elected to race instead of his 1953 2-litre A-type, and Lindsay drove a great race to finish third in the pre-war ERA, half-blinded by oil mist but finding the Murray car nicer to handle than his own. In spite of pressing on, neither the AFM nor Pilkington's Cooper-Bristol could close on the pre-war ERA. That is how they finished this rather dull race, which should have been a post-war walk over. Corner prior to his retirement had set a new class lap-record of 90.17 m.p.h. Margulies' Maserati A6GCM with 250F engine didn't start and Worth was slow in Gibson's 500 Ferrari with 3-litre Type 750 engine, which was beautifully turned-out but unimpressive as a racing car. After a fine parade a Prince Henry and 30/98 Vauxhalls on which the VSCC was virtually weaned (so that it was nice to see Tim Carson riding in one of them) we had the Pre-War All-Comers' Scratch Race, over eight laps. 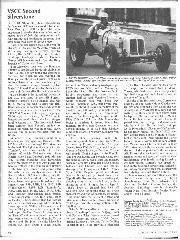 This time Merrick got a drive and used the Murray ERA to such good purpose that, pre-war car that it is and hastily rebuilt as it was, it led from start to finish, pulling out an increasingly impressive lead after the third lap. For a while it had been heading a bunch comprised of Marsh's ex-Seaman ERA, Potter's ERA-Delage and Venables-Llewellyn's ERA. 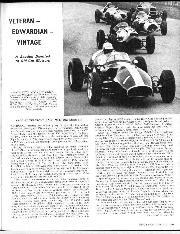 Unfortunately Potter spun at Becketts on lap 3 and dropped far back and Venables-Llewellyn was overtaken by faster cars, including Corner in Sir Ralph Millais' Type 59 Bugatti, which had retained fifth place behind Wall's Type 35B in spite of a full-scale 180 spin at Woodcote on lap 2 as Corner discovered 3rd gear to be missing. The Type 59 is a high-geared car which needs this ratio round Silverstone and when it refused to engage, and as the brakes are no great shakes, Corner's race was in effect over; but all credit to him for recovering so calmly from the spin and driving on to finish third, after overtaking Wall. But the most deserving in this race were Merrick and the 1934 ERA, its oil loss now cured; they lapped faster than any of the other cars, at 81.76 m.p.h., with Marsh upholding the good name of ERA with a very safe second place. Margulies' Maserati did not make the distance. 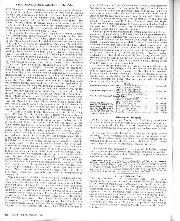 Three 5-lap handicaps completed the programme, the first of which was won very comfortably by Elliott-Pyle's supercharged Hyper Lea-Francis, with Hine's effective V12 Lagonda coming through to second place ahead of Elwell-Smith's Aston Martin which had started from scratch. Sismey's tyre-screaming Alvis Speed 20 Vanden Plas tourer following the Feltham car over the line. Marsh then proved that appearances are not all that count, when his odd-bodied 1936 Alvis Special won its second race of the day, in spite of being re-handicapped 10 seconds. Flitcroft's 1934 Riley was second, Reddaway's under-shielded Frazer Nash third, ahead of Bird's smoky 1936 Frazer Nash. Hine had done best lap in the previous race, at 69.58 m.p.h., and now Marsh again made fastest lap, at 63.75 m.p.h., which I suppose should wipe the derision off some of our faces. . . . It was well-deserved that the last race at this enjoyable meeting should go to the ERA-Delage, which took the lead one lap from the end, to lead home Wall's Bugatti and Russ-Turner's "modern" Bentley, another Bentley spinning at Woodcote, Knight occupying fourth place in his Riley Special and Venables-Llewellyn getting nowhere, although his 2-litre ERA was going so well that it made fastest lap, at 78,44 m.p.h.—W. B.
P. M. Cooper ran a 1929 Austin 7 the fabric body of which is modelled on those of the 1923 works racers, complete with foot-bulge on the metal scuttle, but horizontal SU carburetters. This is the second such replica, the other with metal body, we have seen recently. It was nice to see the Pacey-Hassan Bentley out again, Morley thrusting it along, cornering with rapid flicks on its steering wheel. It has a Rubery Owen frame, and Walter Hassan has helped with the rebuilding of its 4.4-litre Bentley engine. It looked as if it should have brought its own bit of Brooklands banking with it. . . . The Paddock was disgraced by a very scruffy Rolls-Royce coupe with rusty non-original V8 engine. Its windscreen bore a notice asking for advice as to what to do with it. Many of those present could have answered, in two words. Provisional placings to date (not confirmed by VSCC) in the Motor Sport Brooklands Memorial Trophy contest: E. N. Corner, 70 points; H. P. Hine, N. A. Reddaway, 39 points each; J. W. T. Crocker, C. P. Marsh, J. A. E. Marsh, 36 points each: B. M. Russ-Turner, R. J. Clark, 34 points each; R. Potter, D. R. Hine, 31 points each; K. Knight, 26 points; Messrs. Dowley, Brooking, Saunders, Kirby, Clifford, Morris, Eyre, G. Smith, Moffatt, Elliott-Pyle and Merrick, 18 points each. Final round, Thruxton, Sept. 12th. Having featured J. W. Hardwick's 1916 Paden steam waggon in the June issue, it is nice to know that it won its class in the HCVC Brighton Run Concours d'Elegance from Brazil's 1928 Super Sentinel and the 1917 Yorkshire. An apparently derelict ancient Thornycroft lorry is reported behind a cafe in Yorkshire and an old engine attached to a launching winch is said to be rotting away in a shed at a fishing village in Devon. Letters can be forwarded. Fowler road locomotive No. 20223, the last of the "Super Lion" class to be built in 1934, is now on the road again, having been meticulously restored by Mr. Wharton of Witney, over a period of more than 12 years and over 20,000 hours, aided by Mr. Hirons, whose other interest is a 1922 GN. H. P. Hine N. A.